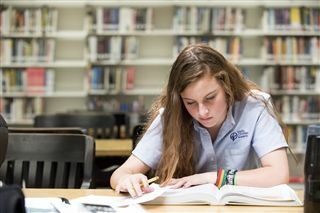 The Upper School Library collection of materials has been tailored to the TCA curriculum and is the first “go to” spot for research. The physical collection consists of approximately 20,000 items (including books, audiobooks, music CDs, and films). The library also provides access to a large number of online resources, including research databases, online encyclopedias, ebooks, and more. Feel free to ask the library staff for help in using the library. Monday -Thursday: 7:30 a.m.–5 p.m.